Australia - IT'S the kind of thing James Walker used to laugh at on the big screen - until it happened to him. The 22-year-old bricklayer was in a Portaloo when his parked car, unregistered and uninsured, rolled down the hill straight into another Warranwood property, where more tradies were at work yesterday. And the only thing between them and almost certain death was a new swimming pool. 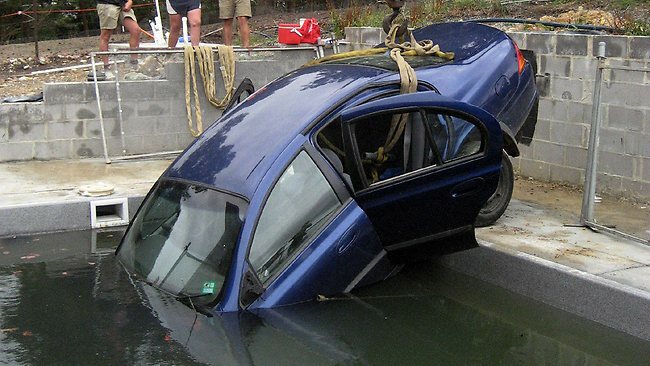 The runaway car - the handbrake was off - didn't have the speed to clear the water trap, and plunged 2m into the pool. Mr Walker will have to foot the bill for damages, which are still being assessed. But it could cost him more than he could save in a year. Adding insult to hip-pocket injury, police fined him $600 for driving an unregistered car for the second time in days. And he was slapped with $600 more to get his Ford Falcon out with a crane. Mr Walker, who tried to start the car after it was fished out of the pool, said his mechanic had also delivered the news that his car was now a write-off. And he'll be taking out a personal loan if the shell of the pool has been cracked. "It's my first accident. It was a good one," he said. "I was actually in the Portaloo, and everyone was screaming my name. ''Only the chippies down the road saw it all happen. ''Luckily, it didn't go over the pool, because it would have gone through them (the workers) and the house. "The chippies thought I was in it (the car) and that I would turn. "I've seen it in the movies and I always thought, 'What a d---head'." He said the damage bill sat at about $2000, but it could exceed $20,000. But it was better than a couple of manslaughter charges and paying a six-figure sum for damage to the house, he said. "I'll have to get a loan or borrow the money from mum and dad. "The owners (of the house) weren't too happy at all," he said.